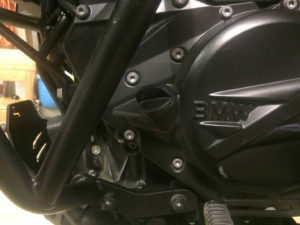 BMW F800GS oil & oil filter change done right, step by step. 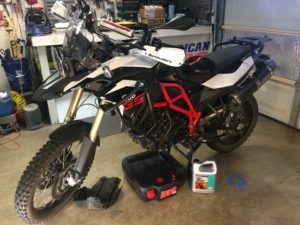 BMW F800GS oil & filter change done right. Changing the oil to your motorcycle is an old classic, everyone can do it, but are they donning right? The owner’s manual on your F800GS states “Both too little and too much engine oil can lead to engine damage. Always make sure that the oil level is correct“. You might say, “ so what is the problem? I check the level regularly” but do you know that BMW has a specific procedure to check the oil? 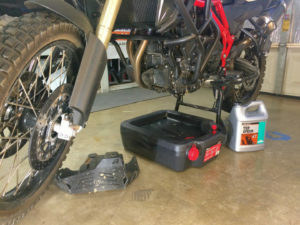 According to the owner’s manual you are suppose to warm up your F800GS by running it until the cooling fan comes on and then one more minute after that before you check the level, also, you are supposed to remove the dipstick, clean it, put it back in without screwing it in and pull it out to make sure the oil line is between MIN and MAX. 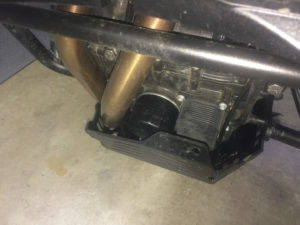 But let’s just jump into the meat of the matter, put the bike on the center stand or if you don’t have it use a motorcycle stand on the rear wheel, remove the skid plate and clean the area you are about to work on (drain plug, oil filter, dipstick surroundings) to avoid debris from falling inside the engine and contaminate the new oil, unscrew the dipstick, place a appropriate sized container under the bike to collect the used oil (REMEMBER TO RECYCLE YOUR OLD OIL), and remove the drain plug. While you are waiting for the oil to drain there are a few things you can do, the drain plug as a magnet on its center, this magnet collects all the metal shavings and particles that the engine produces, so it is time to wipe it clean, at the same time this is a good time to replace the crush washer on it as well. BMW recommends to use a new crush washer for every oil change ( they are not that expensive). When the oil has stopped sipping out it is time to remove the oil filter, remembering that there is still some oil left into it, so don’t remove the container from under the bike just yet, once you have disposed of the old filter, it’s cleaning time again, take a clean cloth or shop towel and clean the excessive oil that has almost certainly spilled on the lower part of the engine. Now that old oil and filter have been taken care of is time to reverse the process and fill the engine of your precious F800GS with fresh oil. Re-install the drain plug, torque it to 30ft/Lbs (40N-m), then, grab the new oil filter and lubricate the rubber washer with a little bid of new oil before you screw it back in, 8ft/Lbs (11 N-m) of torque with your trusted torque wrench, at this point you are ready to pour in 3.1 quarts (2.9 liters) of the new SAE15W-50 oil (BMW recommends NOT to use oil additives and the oil must meet the JASO MA specification) and do the first oil level check, so start the bike let it run until the fan comes on and add 1 more minute. 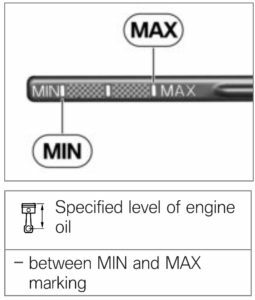 If the oil level is between MIN and MAX, CONGRATS, you have done it, if not, add some more to reach the right level. Since you ran the bike for a while before checking the oil level, now is a good time to check for leaks as well. If you have no leaks, CONGRATS AGAIN, put your skid plate back on and YOU ARE DONE!!!! Drain plug – 30ft/Lbs or 40 N-m.
Oil filter – 8ft/Lbs or 11 N-m.
Oil capacity w/filter replacement – 3.1 quarts or 2.9 liters. Oil type – 4T SAE 15W-50. Do not use additives. Very good, thanks for letting us know. For a 2013 model F800GS is it best to use part number KN-160 or KN-164? The KN website recommends KN-160 for the F800GS, I would stick with what the manufacture says. The K&N website seams to give multiple answers. I’ve been recommended different part numbers at different times. The oil must meet the JASO MA specification; please clearly specify this. For not-so-hot climates (temperature does not regularly go over 100 degrees / 38C, 15W40 may be a better choice. what do you mean they are not right? if you refer to the capital letters, you are right and I changed them, if you talk about the actual torque value, it comes straight from the BMW service manual. Thanks for adding info about the oil specs. Actually, this site recommends the KN-163 if there is room. If that doesn’t fit, use the KN-164 for the older models as well (the only difference between the 3 filters is the length). 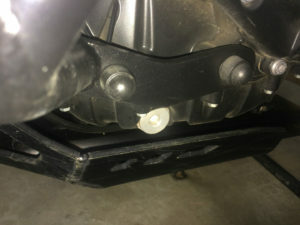 FWIW, the KN-164 fit my 2012 F800GS (US model) with touratech skid plate just fine. Others’ mileage may vary, of course.